Mark Zuckerberg, the billionaire founder of Facebook, will soon be a featured as a comic book hero. This comic is proposed to be released in December 2010, two months after the Facebook movie, The Social Network. 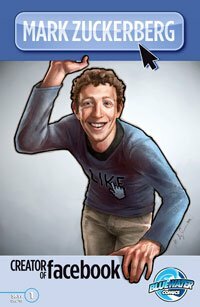 Bluewater Productions is publishing a biographical comic book called “Mark Zuckerberg: Creator of Facebook”, a 48 page giant sized issue priced at $6.99. Who is the real Mark Zuckerberg? The answer, of course, is somewhere in between and Bluewater Productions announced it is filling that gap and exploring the background of the website’s founder in the medium of comic books.